Illustrate that you have flawless taste when you wear one of these charming mens ties. Ties allow any guy to better bring an outfit together instantly. These art inspired mens ties will make you look sophisticated in the office and stylish on date night. 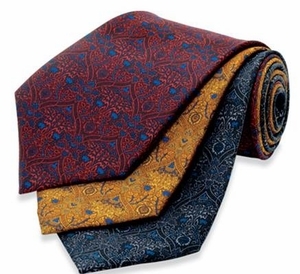 These ties are from the Metropolitan Museum of Art and feature different artist influences. We have ties based on a Louis Comfort Tiffany lampshade. Additionally, we have ties influenced by by the british designer William Morris who produced textiles in the Victorian era. All ties are 3 5/8''W. Any gentleman will look dapper in our mens ties that come in a variety of designs and colors. Upgrade any outfit with mens ties that look perfect with any suit, jacket, or shirt. Show your individuality and style with our artsy mens ties. Shop Decorative Things today to find mens accessories and gifts for guys that add to a handsome appearance. Ladies, these mens ties are gifts for guys that fathers, husbands, bosses and other guys in your life will love. See our natty nautical gifts for men too!